Three stat points at one mana with a minor ability is pretty standard for Hearthstone, but in this case the potential is there to slowly build this lowly one-drop into a formidable threat. Currently, there are a ton of strong neutral low-drops with relevant Deathrattle abilities, including Leper Gnome, Haunted Creeper, and Loot Hoarder. This creates the potential for a massive buff midgame, or even forcing your opponent to waste their removal on a lowly 1-drop. While the community has been split on the issue, the general consensus certainly has been that Undertaker was too strong and needed to be changed. There were several proposed fixes, but in the end Blizzard chose the simplest one in that its Health is no longer buffed along with its Attack when you summon a Deathrattle minion. 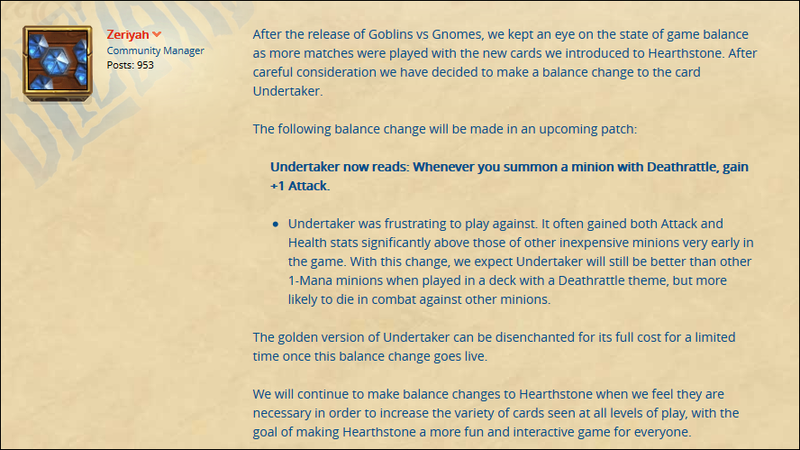 Finally Undertaker nerf! I like aggro being powerful, but not in the oppressing way that Undertaker was.